We are answering God's call to practice faith, mercy, and justice in community. 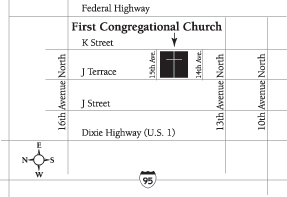 Our church is located at 1415 North K Street in Lake Worth, FL between 10th Ave. North and Forest Hill Blvd and between US1 and Olive Ave. It is a little tricky to find us the first time so leave yourself a few minutes. After the first time, it is a breeze. Our Sunday morning worship service begins at 10:30 AM, lasts about an hour, and is followed by refreshments in our fellowship hall. Our worship service is a blend of traditions you may remember from childhood along with some fresh, inspirational music. Pastor Jason’s teaching is down to earth and you are guaranteed to go home with at least one practical idea you can use to improve your life. You are also invited to join us on Tuesday evenings from 5:30 – 6:15 PM for our completely free Community Dinner where you will enjoy some great food and even better company.